Terrible experience with a terrible host ! To begin with I am as interested eating in five stars as I am at road side eateries like these as you find gems in the most unlikely of places at times. However sorry to say this is no Gem and the food that I have taken away once was nothing out of the ordinary. To top it off the lady who sits at the counter is the closest thing you can witness between rude and almost nasty. Her look mostly resembles that probably she’s doing a service to humanity by dishing away these not so delectable dishes. 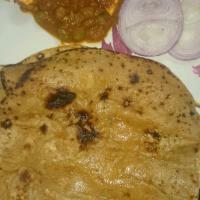 Matar Paneer – 2/5, very ordinary in taste, the green peas were not boiled properly though the Paneer was soft. Butter parantha – 3/5, this was the best item, even after consuming at home it was very soft and had a good amount of butter on it. Lassi – 2.5/5, This was nothing extra ordinary, considering this place promises to be of authentic Punjabi style but the lassi is nowhere close to the Punjabi way of things. It’s not thick and doesn’t have a trace of Malai to top it off. Another thing, make sure that you have change while collecting your order because if they don’t have it they will just keep it as if it’s their right to keep it. All in all a disappointing experience and I am never going back.